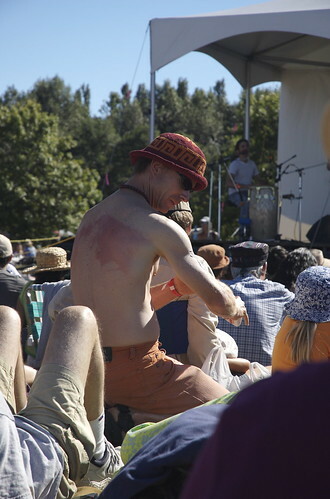 I posted photos from the Vancouver Folk Festival last weekend, but I haven’t blogged about it, and I will probably spend an extra few decades in purgatory for my delay. Nevertheless, I have lots to say. Rachael arranged for tickets for both of us (regularly $125-ish for all three days or $65 for one day) and we went on Saturday. 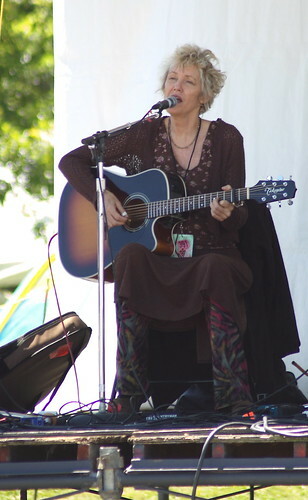 The festival was held at Jericho Beach park. There were seven stages set up, some in sunny fields, some in shady groves. The temperature was fairly hot, and I found myself wishing I’d brought a hat. Rachael had a parasol, which was great for walking around, but when we were sitting on the ground in front of the stage, people behind her asked her (legitimately) to close her small parasol. 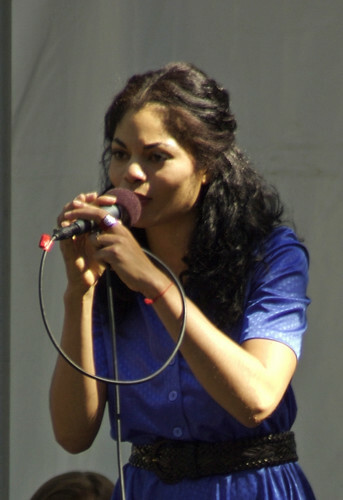 The stages in shady areas seemed more popular than the ones in the sun, but that could also have been because of the performers chosen for those stages. Water was available from several fountains for free, which was nice; most other summer concerts I’ve been to have charged for water. Bring suntan lotion and put it on before you leave the house; the less the sun bakes you, the longer you can last. And for goodness’ sake, don’t be afraid to let someone else do your back. The Web site had a simple schedule in PDF format only; to know what was happening, you really do need to buy a program, which was $3. 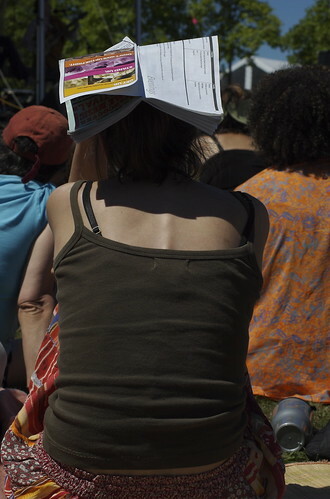 The program can also be used as a sun shade. Monique blogged about the harrowing process of getting a good spot in front of the main stage; I didn’t see it this year, but by the time we got there, we could find only a very small patch free. Be sure to triangulate your blanket’s position so you can find it again later, especially in the dark. The best way is to find a spot that’s on a line between two tall objects — we chose a large speaker on the left and a large tree on the right. The evening concert is a single event that everyone attends; if you don’t know exactly where your blanket is, you’re screwed. Some people brought plastic tarps. I dislike them because they’re hot and noisy. Food-wise, there were lots of good choices. The ones I tried were all very good: A donair, a BBQ chicken sandwich, and a whale tail (deep-fried flattened donut with cinnamon sugar). I’m told the Thai food was also pretty good. The food on plates is very tasty, but all the food I got was on wrappers that could be thrown away, which saves time and hassle. The plates have a $2 deposit and even if you don’t want the deposit back, you still have a plate to return. Boring! Come ready to dance. Even non-dancers look good in that setting, and everyone’s participating. You will run into other people you know. Be prepared to meet up with and lose people for significant chunks of time. If this is worrying, set a rendezvous point. And in general, don’t leave your stuff with anyone else; plans change and you might really want your camera or a jacket later but not be able to find anyone. Outside the festival on the seawall, there were some amazing vendors from all over the place selling interesting merchandise. Pillowcases from pakistan, wooden necklaces from central B.C., homemade hackie sacks. I bought three hackie sacks and I’m re-teaching myself to juggle. The scene. Where to start? It’s the best people-watching event I’ve been to in years. And not just because that one lone woman was nekkid. Basically, take a long hot day, add in groovy music and funky dressers, and you end up with a lot of eye candy, for guys and girls both. Every age group was represented, from 4 to 84. 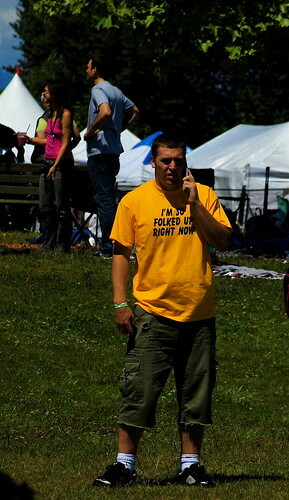 The whole festival seemed very wholesome and safe, and everyone seemed basically happy to be there. Oh, and what about the music? Well, actually, that was a little disappointing to me. I love traditional folk music: Stan Rogers, Iron and Wine, Celtic tunes and the like. Strong vocal harmonies, string instruments, wise lyrics. Now, maybe I’m a little narrow in my views, and I will freely admit to being uneducated about 99% of the musicians there. But hey, I think most of the people there were only slightly more tuned in than me. Folk music, to me, doesn’t mean world music. It doesn’t mean spoken word poetry. It doesn’t mean “Love Everyone”-lyrics to a techno-dance beat with didgeridoo highlights. It doesn’t mean jazz or modern blues. I’m not saying that each of these kinds of music isn’t great, or that it wasn’t done well at the festival. It just wasn’t what I was expecting. So, while much of the music was wonderful, it wasn’t folk to me. If you’d like to see my photo album of the whole day, click here. I think you’ve just saved us both from purgatory for finally blogging about this. You forgot to mention – BRING WARM CLOTHES for the evening!!! “Even non-dancers look good in that setting, and everyone’s participating.” So, you’re saying, all them hippy white folk getting their groove on lowers the bar far enough so that anybody can get into the act? It’s just a theory, but I’d guess that the festival organizers choose to expand their musical offerings beyond the traditional definition of western folk music to devise a bigger festival with a more diverse audience. Plus, of course, there’d be a fair bit of cross-over between the audiences. 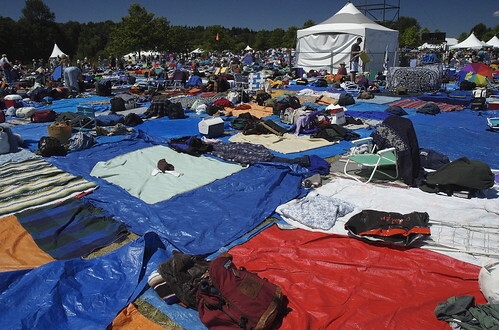 Did you ever go to the Calgary Folk Festival whilst you lived in this fair city? It was this weekend–four days long on Prince’s Island Park–and it absolutely rocked!! 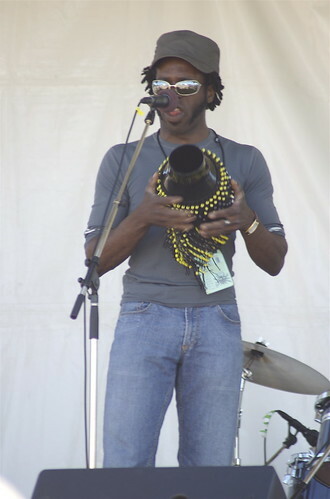 Like you say, there was some world music and spoken word stuff I could have lived without. But I heard quite a number of protest songs (which pleased me greatly!, mainly on the smaller stages as opposed to the main stage. Some funky Celtic and Cajun stuff too–and a very interesting “Yiddish Ensemble.” This is the first year I have been and I HIGHLY recommend it. I am still smiling 24 hours after it ended.